Founded in 2010 by Zanzan, OMunity Green Resort’s mission is to provide a sustainable future for posterity: a world without plastic, dangerous chemicals and toxic fertilisers, where humans and nature thrive in symbiosis, the way nature intended. We are going back to the basics – what our ancestors understood and practised – an environment where tourism entails being curious about a new culture, and discovering its roots. Through food, culture, language, and way of living, tourist can get to know a new culture without destroying Bali’s greatest asset: Mother Nature. We seek to educate and facilitate a cultural exchange between locals and visitors and to bridge the gap between environmental concerns and human interests through practical education and the involvement of Sudaji’s community. The concept for OMunity is living with and among the community and local people of Sudaji, not against them or to nature’s detriment. Join us if you would like to experience first-hand real Balinese people and culture. ZANZAN is a passionate individual beaming with ambition and creativity. His inspiration for building Omunity came about from his experiences with influential sustainable tourism mentors, locally and globally, as well as deep self-introspection and revelation. With the support of his family and friends, ZANZAN took on an intensive 33-day meditation and upon completion of his inner viewing, he came to the realisation that his calling in life was to focus on the youth and community in Sudaji. One of ZANZAN’s gurus, Peter Voss, advised ZANZAN to “follow his heart” and bring his vision of Omunity into fruition. ZANZAN does just that and develops the foundation for Omunity’s vision with the five C’s of [C]ommunity: Create, Concept, Commit, Consistent, and Client (Collaboration). Since then, groups from around the world have come to learn and explore at Omunity and ZANZAN attributes current and future success to having a pure heart that pushes this ‘miracle power’ forward. By having Omunity serve as a centre of cross-cultural awareness, ZANZAN endeavours to create an exchange of ideas of life that will ultimately help uplift and empower the community of Sudaji. At OmunityBali we have several styles of accommodation, all handmade with organic materials by the community of Sudaji. 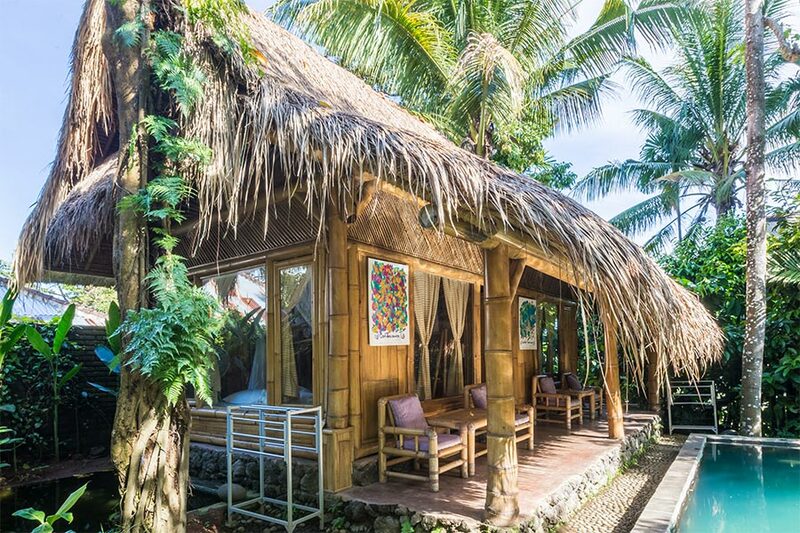 Firstly we have “OMStay”: four traditionally built Bamboo houses styled after the dimensions of a Balinese cow house! These exclusive buildings face directly towards the Wantilan and are beside the swimming pool and round pool waterfall. These buildings are eco friendly, beautifully decorated, have high ceilings, with gorgeous plush canopy beds, made by hand with the highest standards. They all include an outdoor covered ensuite bathroom. Sleeps 1-2 guests. The time that I have spent with you here has been very, very special to me. I left my life exhausted and tired of riding around in the car, going shopping and appointments. I will go home with a new relationship with the earth, my community and myself. Thank you for an extraordinary experience of welcoming friendliness, interesting insights into Balinese culture, amazing food and lots of fun… thank you ! Sudaji is a rare gem in Bali, untouched by tourism, surrounded wildlife, farms, rice paddies, temples, and a bustling river perfect for rafting. It’s residents are incredibly outgoing, curious, warm and friendly, and are living with the traditions of their ancestors. Sudaji is the home of the majestic Sekumpul waterfall; a seven level cascade featuring an 81m and 108m twin waterfall. It is the tallest waterfall in Bali and claimed by many visitors to be the “Mother of all waterfalls in Bali”.